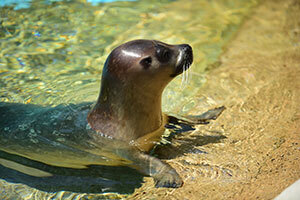 The Milwaukee County Zoo is pleased to welcome Cossette, a new female harbor seal. Born at the Alaska Zoo last year, Cossette celebrated her first birthday on June 14. She is here as part of the Species Survival Plan® (SSP), in order to maintain genetic diversity in the captive population. According to her zookeepers, Cossette is a very quick swimmer. She joins seals Ringo, Sydney and Siku. Like her new exhibit companions, Cossette’s favorite food is herring. As enrichment, she is given frozen fish-cicles (similar to Popsicles, except with fish treats!). She also receives balls and other enrichment items that she can manipulate, artificial kelp, bubbles, and music. Although harbor seal populations are stable in the wild, they are threatened by overfishing and pollution. Learn more about harbor seals during our Animals in Action talk, daily through Sept. 5 at 3 p.m. at the Harbor Seal Exhibit.